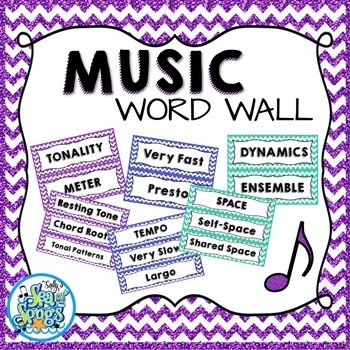 Sally's Sea of Songs: What's on Your Wall - Check Out the Music Room! We spend so much time in our classrooms - they need to be beautiful and functional! 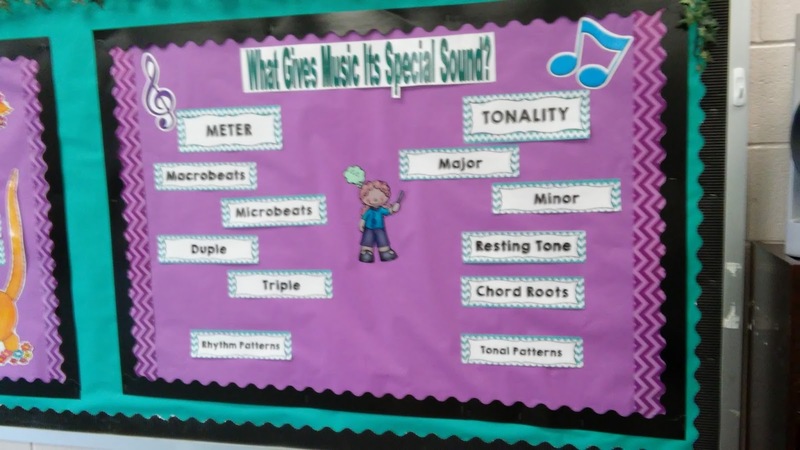 Thank you to The Bulletin Board Lady-Tracy King for suggesting that we share our music rooms with everyone. 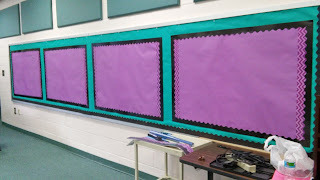 Here is a peek at my beginning-of-school bulletin boards. The first section, the prime real estate, contains the terms associated with meter and tonality because we work with those terms all the time. The second section will get changed every so often. We're starting out the year with steady beat and tempo, so I decided to get my Tempo Cats out again this year. They are quite old, but I take them out of the rotation some years so that when I do use them, they are new, especially to the younger students. 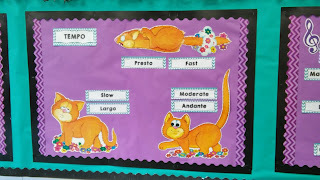 Please check out my 2nd Grade tempo lesson ideas using music from the Carnival of the Animals! Here is the link: Behind the Scenes at the Carnival of the Animals - Tempo. Next, is my Composer of the Month section. Well, truthfully, it is just the Composer section. I don't always get it changed every month! My district has specified certain composers that each grade level should focus on, so I do get at least 6 different composers up during the course of the year. This year, I am starting out with the great set on Bach from Music with Sara Bibee. 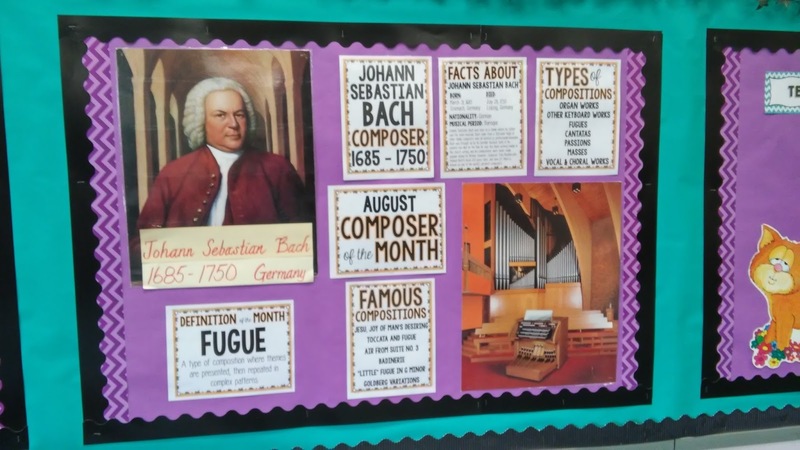 The picture of Bach and the organ poster come from very old sets of composer & instrument posters. I think they have been in my room for 20 years! 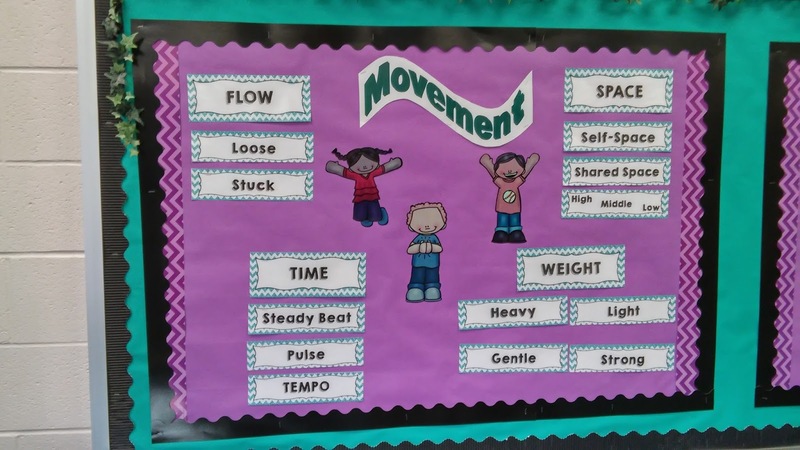 The last section of this long board contains my movement words based on Laban's basic efforts. 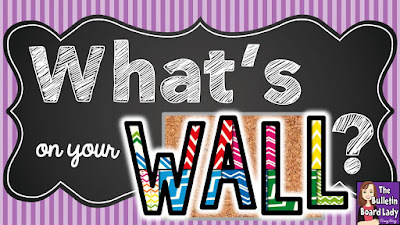 It is good for students to be able to verbalize what they are doing, and having these words available adds appropriate terminology to our class discussions. 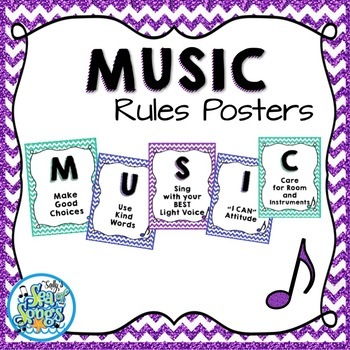 In the front of the classroom, right next to the SmartBoard, are the MUSIC rules and I CAN statements. 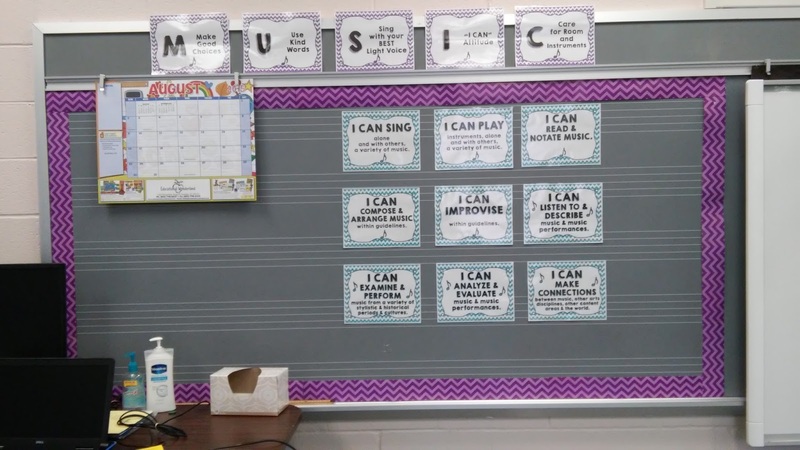 The I CAN statements are new to me this year. 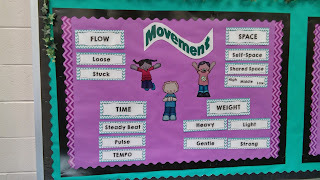 I put them up with magnets because I am really unsure if I want all of them to stay up all year, or if I should just put the focus statements up. You can read about my pack rat magnet success here. 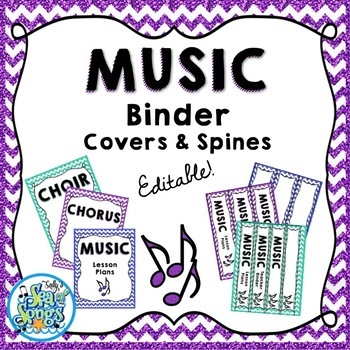 All of these word wall words (and more), music rules, and coordinating binder covers are available in my Teachers Pay Teachers shop. Now, perhaps you noticed that I didn't share any pics of shelves or desk or closet. There's a reason for that! 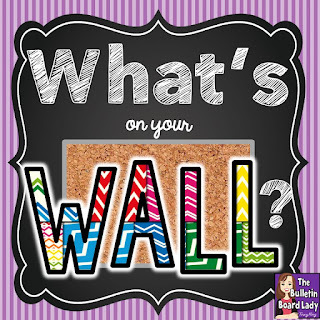 :) I'm going to be looking through all of the other links for some great organizing ideas to get my paperwork under control! You can check out the other music rooms by clicking on the picture below. Thanks for taking my tour! Oh my goodness! I love the color scheme of your classroom! Too cute! 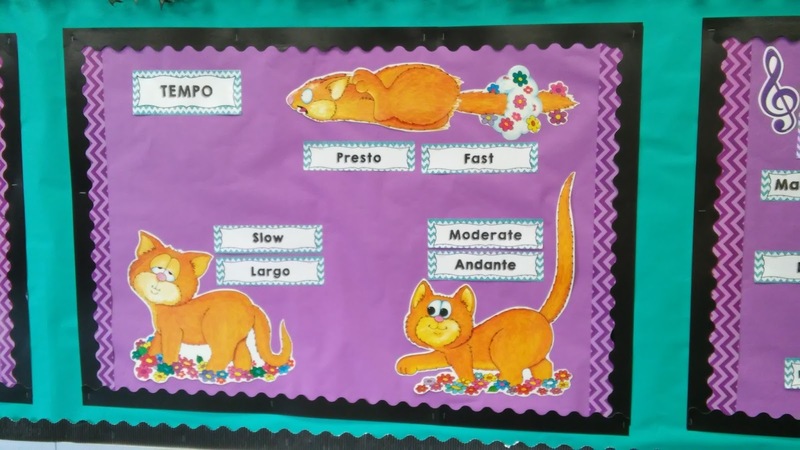 I'm also jealous of your tempo cats. *giggle* I lost Presto a few years back (I have no idea why he wasn't laminated!) and now they don't make them. Thanks for linking up! I hope you have a fabulous school year!